Belittled as a peasant, but my bloodline is of kings. This is the embodiment of the southern way. 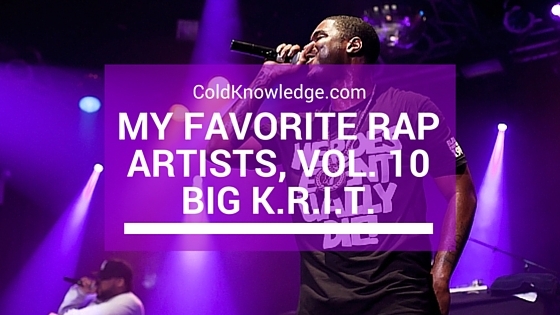 Out of the new generation of MC's taking over the game J. Cole is undoubtedly my favorite, but K.R.I.T. is starting to challenge him for that spot. Since the beginning of the year K.R.I.T. has only grown on me and my ever changing taste in music. When the year started I was bumping Cadillactica religiously and telling people routinely that he put out the second dopest album of last year after Cole. After Cole & K.R.I.T. dominated my ears, I gave Big Sean's Dark Sky Paradise heavy spin because, women problems. Then after that I gave Drake a little run, but then it all came back to K.R.I.T. and I found myself digging through his discography and watching videos on YouTube that I didn't know existed. It was so dope finding all of the gems from an artist that I personally took for granted. I think it's just dope that first and foremost that you can go on YouTube and find videos to his dopest songs that weren't shot by big budgeted Directors. The visions for his videos were on par with the songs message and that is high underrated these days. Videos that deserve clearly more views than they have are being praised in the comments section by fans and people who are discovering his music just like me. I think that's the dopest thing because people are quoting lyrics that matter and they realize what an MC in the flesh looks like. If people think Kendrick is on this whole conscious tip, then they need to get hip real fast to K.R.I.T. because judging by songs from as far back as 2010, (I've been working myself backwards through his catalog), he has rhymes deeper than Kendrick. There's a reason why Kendrick named dropped him on Control, because he's one of the best MC's out. I didn't really bump K.R.I.T. like that but I still knew he was the truth. If David Banner put Mississippi on his back and bought them to the national light, then K.R.I.T. is the guy who took the torch and is currently holding it down for not only them but the whole south in general. He not only delivers rhymes that would put most of the game to shame, he also produces a lot of his own music. While I enjoy that a lot of people think that's a handicap, but I love hearing those old southern soul filled highs and lows, and obviously so does Def Jam because they signed him. He's only getting better with time and effort, and with the ease at which he's dropping stuff, don't be surprised when the rest of the world catches on to him and what he's been doing since 2005. I'm putting this out there now, K.R.I.T. will definitely be in my top artists by the end of the year and that you will like at least ten of his songs, if you are on that level musically. But I strongly cosign and suggest that you at least check out some of his stuff. He's going to be around for a long time and he's only getting better with each release.